If you find yourself eye-rolling every time someone relates literally any slight health issue to your lack of water intake, then perhaps it's time to face the facts and start hydrating! We totally understand how hard it can be to make a habit of it, despite all the amazing health benefits that we practically know inside out. That's why we've got your back with some not-so-genius hacks below that will make it a lot easier, fun, and motivating to get in that extra glass! Adding in your own mix of infusers not only upgrades basic-looking water to some IG-worthy material, but also naturally flavours it without all the extra sugar! Of course that's in addition to the countless natural vitamins and nutrients absorbed (and eaten) from your favourite fruits and leaves. If you're stuck on what to infuse, just remember to add in ingredients that won't dissolve quickly and will stay fresh in your water throughout the day! 2. 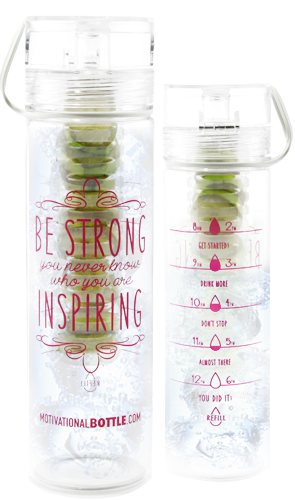 Let your bottle motivate you - literally. There are two ways to do this, and of course the best results will come from doing both. The first way is to either buy or DIY some water measurements onto your bottle to keep track of your intake throughout the day. If numbers don't speak to you as much, opt for plan B: add on some good old motivational words! Although this seems too simple, a pretty bottle and positivity go a long way! This is one of the few cases where cheating with food is totally okay! In fact, munching on some H2O-filled fruits and veggies will help you reach your daily hydrating goals without even realizing! Try snacking on more watermelons (duh), cucumbers, grapefruit, and zucchinis for great sources of water-based foods that will help up your intake level! Bonus tip: Bring your salads up a notch by adding some of the water-based foods shown below. Yes, there is an app for that. In fact, there's plenty! If you're dedicated to setting specific hydration goals, Daily Water and Waterlogged are good apps specific to setting reminders and tracking your water intake (oh, and they're free). On the other hand, if you're not an app-hoarder, and you have bigger fitness goals you'd rather focus on, fear not! There are tons of popular fitness apps like MyFitnessPal and Fitbit that give you the option to log your water intake as well! This hack is as easy as asking the waiter for a water refill for every soda or alcoholic beverage you order. Not only will this bump up your water intake on a casual Friday night, but it also reduces hangovers in the morning! Bonus tip: Keeping this habit up will get you a free bathroom pass in the event of horrible blind date. Whether you consider yourself healthy and hydrated, or completely failing at the whole 8 glasses a day thing, these hacks are guaranteed to encourage and improve your overall hydration habits with literally half the required effort - and maybe some extra Instagram likes! *Please note that none of the apps listed above are being advertised nor have they been tested for the information provided in this article.